Alberta weather has always been highly variable, but this month has given new meaning to the words. For most of January we were basking in temperatures five to seven degrees above normal. The last day we had any measurable snow was Dec 21, meaning our winter has also been unusually dry. In mid January, a huge prairie grass fire, accompanied by strong winds, closed down major highways and caused the evacuation of a small town. On January 3, we actually set a new temperature record, glorying in a sunny +15C (60F). Eight other centers in the province also set records that day. Many of us never bothered even digging out our winter coats. The local rare bird alert has been an interesting read. Cinnamon teal, green winged teal, redhead, gadwall, lesser scaup, northern pintail, belted kingfisher, hermit thrush, varied thrush, turkey vulture, trumpeter swan and killdeer appeared on the January bird list. Except for the killdeer (15 reported at once), most of these sightings were of single birds. All good things come to an end however, and on Jan 15 winter finally remembered we were here. The temperature nosedived to around -20C (-4F) at noon, with a slight wind. You might imagine the yard would be quiet, with the birds huddling in the warmest spots. Maximum fluffing. Fluffing their feathers is one way birds keep warm, trapping more insulating air near the body. And boy did I have fluffed birds. The grackle that has been making sporadic visits this winter showed up at the black-oil sunflower feeder in the morning. He wasn’t this big a week ago. Two highly fluffed mourning doves appeared at the sunflower chip feeder on the deck. The black-capped chickadees were more hyper active than usual so I couldn’t get a photo, but they’re even cuter in maximum fluffiness! Then in the afternoon, I glanced out the window and counted eight robins. Really, really, fluffed robins. Poor things. Even the normal winter birds were fluffed with the rapid change in temperature. This poor little downy was nearly twice his actual size, and the red-breasted nuthatch was a fluffball. Unfortunately old man winter wasn’t satisfied with just -20C. That first cold night we had moon dog, an indicator of continuing clear, cold weather. Sure enough, the third week of January brought a couple days with a ‘high’ temperature of -29C (-20F), which dipped down to -35C (-31F) at night. The dog never got her walk on those evenings, but she didn’t seem to mind. Our normal winter birds moved to the feeders enmasse. Feeders were being refilled as soon as they emptied, sometimes twice a day. Everyone is reporting a yard full of common redpolls, they’re still at all my feeders both front and back. If I haven’t found a hoary redpoll it wasn’t for lack of time spent peering at busy little red-topped birds all day. Then the bohemian waxwing cloud moved in – I had about 20 in my mountain ash, but they were spread over several yards that I could see, and possibly the whole neighborhood. There is not a mountain ash berry remaining for blocks. As I write this, temperatures are climbing back into the plus digits, meaning that small trace of snow we received last week will soon be gone. The grackle, doves and robins are still here. Now the local bird alert is reporting a possible early migration, with thousands of ducks showing up in the last few days. Would anyone care if I just hid under the bed until things go back to normal? I have no idea what to look for in my yard. Winter birds? Summer birds? Robins are usually a great indicator of spring, but seeing them on a -20C day kind of blew that out of the water. How will I know when it’s spring? Ah, I know. It will be spring when the first insects show up in the yard. Of course! 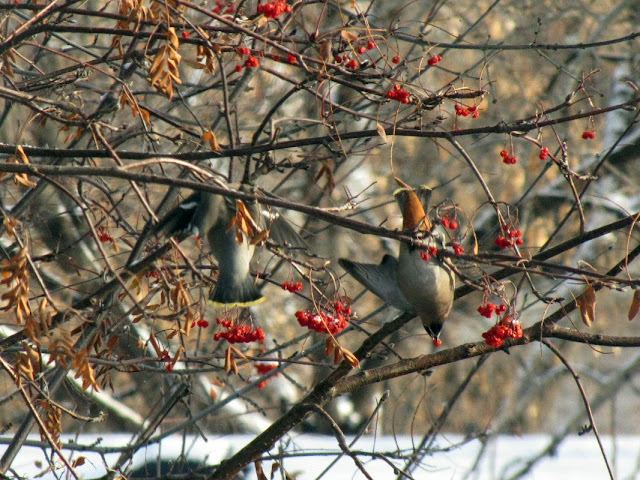 Pat, winter has been weird here too so I can totally relate to your post.The mass of Waxwings must have been awesome! ...same for us down here in Cincy. Normally we're covered in snow now, but we've no need for winter coats now--sweatshirts will do. Loved the photos of the fluffed-up robins and the flock of waxwings! Stay warm and thanks for the great photos. 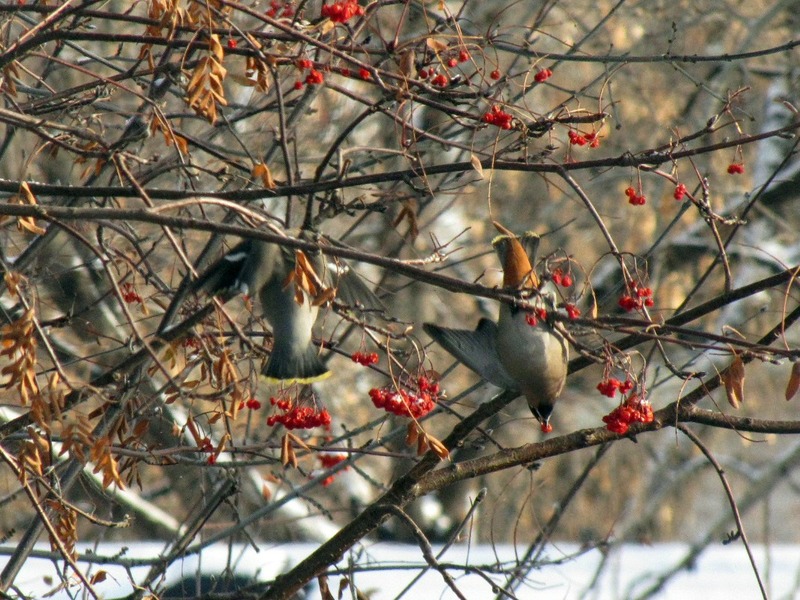 Love the waxwings! Great Birds and photos Pat! Hope you had a Eggstra Special Bird Day! Every time I see photos of birds in snow I get jealous. Nice photos. What kind of Grackle is that? I am so jealous about the redpolls and Bohemian Waxwings. I still have never seen a redpoll and it is been a few years on the B-Waxwings. Nice post and photos. Don't you wish you could bring some of those birds inside to warm up? We have had an especially mild winter here in Chicago. I have not even pulled out my heavy winter coat yet! Not to nix your spring insect theory, but I spied a big fat fly while outdoors yesterday. I was shocked. I really enjoyed viewing the photographs of all of your fluffy backyard feathered friends. Love the Red-breasted Nuthatch and Bohemian Waxwings. Wonderful post, as always! Thank you all for the wonderful comments. Robert I have a common grackle, and see redpolls from every window - I've never had this many before. Scott, you're welcome to our snow and Julie - please send fly. Love the gr8 pix and blog, Pat! Wow, anything around freezing is cold to this desert rat. But -31F! I can't imagine. Cool snow bird photos!